Philadanco founder Joan Myers Brown is collaborating with String Theory Schools on a proposed new charter school that would be named for her. Philadanco founder Joan Myers Brown, known for training and presenting some of finest modern dancers in the United States, is collaborating with String Theory Schools on a proposed charter school that would be named after her. The Joan Myers Brown Academy would be a K-8 school near Brown’s home in West Philadelphia modeled after String Theory’s three other performing arts charter schools, with a special focus on dance. There will be a public hearing Jan. 22 for the academy and two other proposed charter schools, and the school board has until March 2 to make a decision on approvals. Charter proposals have not always been approved, and with a new school board, it is even less clear how members will vote. If approved, it would open in September at 3905 Ford Rd. “They asked if they could name it after me,” Brown, 87, said of String Theory. But she wanted more. Her plan is to step away from the day-to-day leadership of Philadanco after its 50th anniversary in 2020. Philadanco performs Milton Myers' "Pacing," part of its "Choreographers on the Move" show at the Kimmel Center in November, 2018. “We started talking about how children are no longer interested in training," Brown said. "They see So You Think You Can Dance and Dancing with the Stars and want to do ‘trick, trick, trick,’ ” rather than putting in the hours honing proper technique. The Joan Myers Brown Academy would be housed in the former Wordsworth Academy, which was a residential school for troubled youth. It closed in 2017 after a child died. The school is one of 20 new locations String Theory is looking to open around the country, said Jason Corosanite, String Theory’s cofounder and chief innovations officer. For this one, Corosonite said, they’re focusing on the neighborhood. The three existing String Theory performing arts schools enroll from a citywide catchment, but the Joan Myers Brown Academy would give preference to three West Philadelphia zip codes (19131, 19151, and 19139), leaning toward students of color. That would align with Brown’s mission of giving talented dancers of color a place to study and perform. String Theory has already taken Brown’s first suggestion, to expand its curriculum to offer contemporary dance classes. 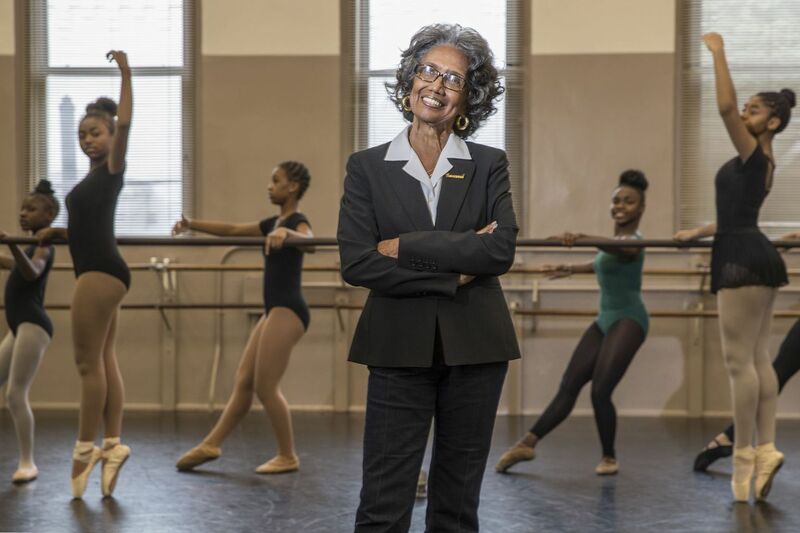 On her recommendation, it hired Ali Willingham, one of 30 teachers Brown employs at the Philadelphia School of Dance Arts, which she opened in 1960, 10 years before launching Philadanco. Willingham also directs D3 Minis, a performing troupe for talented 8- to 12-year-olds. Most career-oriented dance training comes with similar exacting expectations, in addition to teaching dancers a range of styles. To succeed at an audition, “they have to know more than ballet and jazz,” Brown said. They need specific modern dance techniques, such as Graham, Horton, and perhaps Dunham. The school would include such diversity. Brown’s former students included Leslie Odom Jr., who was the original Aaron Burr in Hamilton, and TV producer/film director Lee Daniels. Many others she trained have danced with Philadanco, Alvin Ailey American Dance Theater, or on Broadway. Leslie Odom Jr. (center) stars as Aaron Burr in "Hamilton" at the Richard Rogers Theater on Broadway. The charter school’s curriculum “would start with ‘what do you do with kids from kindergarten? How do you progress?' " Brown said. Dance history would be “weaved thematically” in academic classes, Corosanite said. “Are we producing the next Philadanco dancers? You don’t get to that point unless you grow up with it,” he said.